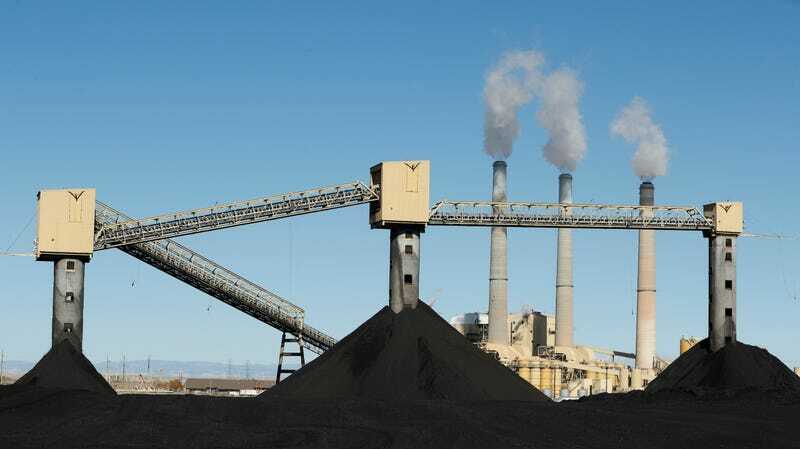 Filed to: more like coal power plan amirite?Filed to: more like coal power plan amirite? more like coal power plan amirite? On Tuesday, the Trump administration released a new rule proposal at the center of its environmental deregulatory frenzy. The long-anticipated rule would replace the Clean Power Plan, an Obama era initiative to rein in pollution from coal-fired power plant that was considered the former president’s signature policy for combatting climate change. The proposal is dubbed the Orwellian “Affordable Clean Energy” rule. The public will have 60 days to comment on its merits or lack thereof. One thing Trump’s Affordable Clean Energy rule will do is likely allow older coal plants to hang on a bit longer than they would’ve otherwise. That will hasten climate change along with their copious carbon pollution and endangering public health with soot and particulate matter emissions. One of the key differences between the Trump rule and the Obama one is the lack of pollution goals. The Clean Power Plan had a goal of cutting carbon emissions 32 percent below 2005 levels by 2030. The Trump plan lacks any national goal in comparison. In talking points obtained by E&E News, the administration says the EPA’s own analysis shows “the proposal could reduce 2030 CO2 emissions by 0.7% to 1.5% from projected levels” under a business as usual scenario compared to 2005. In other words, it’s not going to move the needle much, though the talking points also inexplicably label the plan “comparable” to the Obama regulations. The proposed rule will result in at least 12 times more carbon dioxide ending up in the atmosphere than if the Clean Power Plan was implemented according to the EPA’s own analysis. That would send the climate spiraling further out of the range humanity has thrived in for millennia, increasing the risk of deadly heat waves, explosive fires, and flooded coasts. It would also poison people—largely communities of color—with more toxic air, creating more environmental injustice. The administration’s own analysis also shows that the plan would result in 1,400 more premature deaths than the Clean Power Plan. The proposal fits within a broader series of moves by the Trump administration to prop up the fossil fuel industry, including a recent proposal to weaken fuel economy standards and revoke California’s right to set more stringent pollution limits. That proposal already faces stiff legal headwinds, and the new power plant proposal likely will as well. State attorneys general have already hinted that they’ll sue the administration over the proposed rule, tying it up in court for years to come. And as University of California, Los Angeles law professor Cara Horowitz notes at Legal Planet, any arguments the administration makes in court defending the rule “will be made against the backdrop of EPA’s own determination that carbon dioxide pollution is a danger to public health.” In other words, the administration will be tasked with defending weakening a policy to regulate a pollutant its own agency deems a threat.